In a world that, for the most part, embraces the value of cleanliness, there are two groups of people. Those who shower–the git ‘er done folks who don’t dilly dally, and the soakers–those who embrace the peace of the moment. With limited time, I value a few moments alone to think in the shower. Imagine my surprise when, upon entering my little haven, I was sharing my space. With a five inch gecko. Have I mentioned the fact that I’m not a big reptilian person? At first, I thought he was dead. (I think of all reptiles as “he”.) He didn’t move. I watched him to see if he blinked. (I don’t even know if they have the ability to blink.) Feeling certain he was kaput, I grabbed a paper towel and tried to grab him by the tip of his tail. Burial in the toilet sea. He didn’t just move. He ran. I screamed. He ran faster. I tried easing him out of the shower with the paper towel, which only made him run faster. In circles. After five minutes, I realized this was a losing battle. I had no time. 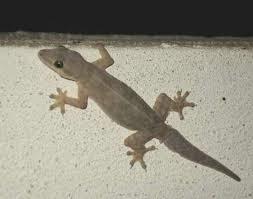 What can a little gecko do to me? I’m a thousand times bigger. I could squish him if I needed to. And he didn’t stop moving. I’ve now perfected the shower dance. Accompanied by the shower screech. One eye open to watch the positioning of my friend, always moving. Not really remembering if I washed my hair. It was wet. So be it. I’ll confess I tried spraying him with Clorox. In the guise of cleaning the shower. May PETA have mercy on me. Obviously these little buggers are made of tougher stuff. The kind of stuff that allows them to thrive in nuclear waste and other dangerous environments. But he totally caught me off guard. There’s a very good likelihood, living in Florida, that this type of situation will occur. But I wasn’t prepared. I panicked. Got soap in my eyes. Did a goofy shower dance. This couldn’t possibly be the big deal I was making it out to be. It was an inconsequential detail. Isn’t that life? The little incidentals that catch me unaware become a focal point of frustration. The important things I want to focus on become lost in my dithering. There once lived two sisters, one of whom became panicky when details for a party got out of hand. She fretted over her sister sitting and listening to their guest, not helping her in the kitchen. When she whined to the guest about her frustration, He helped her put it in perspective. Of all the things that occupy my time and thoughts, there are very few things that impact my eternity. Spending time with Jesus regularly gives me capacity to handle the frustrations and fears in life. He puts things in perspective. Time with Him is the one investment that pays back 100%. 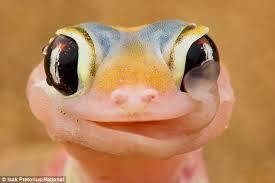 Geckos will come and most assuredly will go. Jesus is forever. That’s a detail worth focusing on. First photo courtesy of thailandbreeze.com. Second photo courtesy of dailymail.co.uk. Posted by daylerogers on April 16, 2015 in Uncategorized and tagged baths, fear, Florida, frustration, geckos, Jesus, panic, paper towel, PETA, shower. Blink, blink. Lizards do. Turtles do. Snakes don’t. And being small doesn’t keep them from being too creepy to share a shower with. I salute you! The fact that he didn’t stop running in circles made me dizzy just trying to focus on the little bugger. Thanks for the fun fact about blinking–had no idea. I dither, also Dayle [aside from laughing at you!] Our daughter was named for Mary – although we’re Martha’s at heart! JESUS IS FOREVER, and HE DOES PUT THINGS IN PERSPECTIVE! Blessings and Love to you both, IN HIM! And don’t we all need perspective! Thanks, Lo.